omid (mashhad, Iran) on 2 June 2017 in Landscape & Rural and Portfolio. It has a real Swan Lake. The color of the light is fine, not that gorgeous .. The feeling is .. the gorgeous is not really enough and I do not invent it anymore. Such a wonderful sense of calm here . .
Quelle jolie scène avec de magnifiques couleurs. Waaaauw...So colorful and what a swans ! It's always nice around here :-)! Oh yes! Five Star Spotlight material. They are in the front row to watch another sunset. Wow, there must have been a convention of the. Amazing shot. چرا با روح و روان مردم بازی می کنید!! Breath-taking. This photo works on so many levels, I cannot take it al l in with only one viewing. That the image is beautiful of those birds that awaken in the pink sweetness of the rising sun ! A magnificent gathering of birds in the red light! Wonderful reflections and silhouettes! So many Swans together ........... Fanstastic sunset colours to join them!! 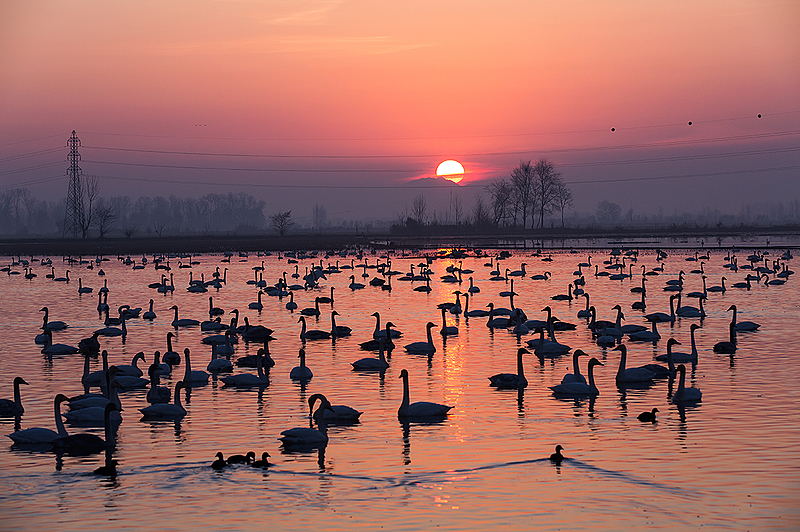 Beautiful sunrise colors and lovely swans. Des grands des petits quel ciel quelel couleur et rendu sueprbe. It has been a long time since I have watched or commented any of your photos. I think you don't need my comments, you know that I really believe you are a great photographer (at least one of the best in Aminus3) and all the photos you post are just great no matter if I add a comment or not. I am going now to catch up on watching the photos I have not seen in the last two months, but I will probably not add any comment to many of them. I just don't want to repeat: Great! Great!.... I love them all. I am glad you like my photos.